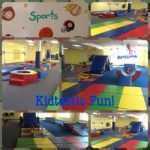 Kidnasium is a Children’s Recreation Centre located in Toronto near Yonge and Eglinton. We offer a variety of recreational classes and activities that promote physical literacy and mental strength. Kidnasium’s goal is to create a fun, educational and nurturing environment which allows children of all ages to develop physically, mentally and socially. We understand that every child is unique, it is our goal to work with each child to get them to a level where they can feel confident in themselves and their abilities. We provide an encouraging and positive atmosphere where children learn to work hard, have fun, and try new things! Every Child is a SUPERHERO! Building self-esteem, social skills, and coordination by teaching basic gymnastic in a fun, clean and fully equipped gym setting. Mini trampoline, balance beams, climbing, jumping opportunities and more. March and summer camps.